"The presidential election has the potential to be one of the most important in decades. Every fundamental question of national values and national policy is up for debate -- or should be … . 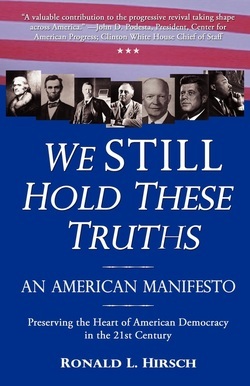 Ron Hirsch's "We Still Hold These Truths" is a systematic and serious effort to make that debate as clear and valuable as it can be. Agree or disagree with his specific conclusions, the questions he is asking are the right ones for the public this year."